I like to bake cauliflower florets in the oven with a dollop (generous teaspoon) of harissa. I cover the dish with a wet, screwed up bit of greaseproof paper for the first 15 mins so they steam and soften a bit - then give it another 30-40 uncovered to crisp up a bit. Sometimes I put small cubes of potato in too. Yummo - converted the cauli haters in my house! Oh that sounds delicious! Must make harissa. Coat pieces with olive oil then sprinkle with parmesan, salt and pepper. Roast in the oven till crispy. 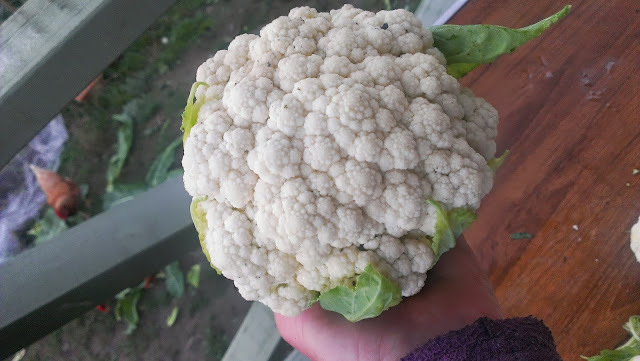 Your cauliflower looks wonderful, I never have luck with it. So simple and so appealing.thanks for this one! Its a cracker. My fav cauliflower recipes are spicy cauliflower and cauliflower risotto. I have posted on both before. Oh and spiced cauli fritters- I also posted on them. 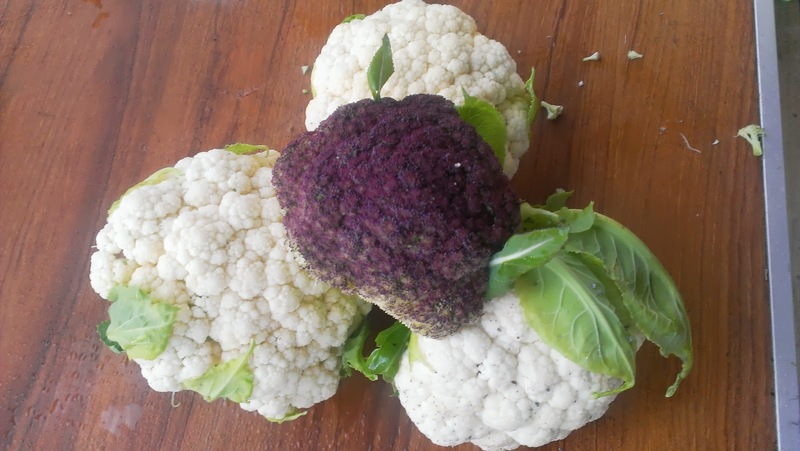 I really like cauliflower - sadly my hopeless family are less fond of it so I have to be a bit inventive with it. Just thought of another one. Roasted in florets put in with a chicken for the last 30 mins of its roasting time. They take on all the lovely chicken fat and juices - really good! Fab, thanks, I'll lookthem up, they sound great. Tonight I made a cauliflower pasta with pine nuts and home made pancetta with pecarino and pine nuts. And with home made pasta, it was very good. I second spiced cauliflower fritters! I also posted a recipe on my blog, but google will give you heaps of ideas I'm sure. I like mine spiced with lots of indian spices, and onion in the mix gives them a nice sweetness. 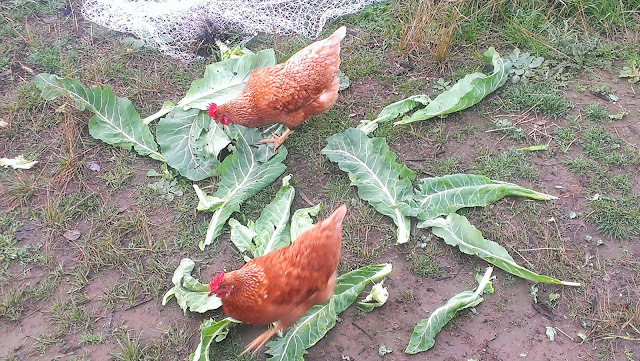 Great to see your chooks enjoying the leaves, I recently pulled a whole one out and put it in the duck pen and they devoured it. So much fun to watch! Yum, just made some spicy fried caui fritters from a recipe on the web. I used chick pea flour and ate them with a garlicy yoghurt sauce and a bit of brinjal pickle. Fantastic! Hi there, my favorite at the moment is curried cauliflower soup we all just love it. It is so cold here at the moment that soup sounds perfect! I have made cauliflower as a base for pizza. It didn't pick up as easily as the pizza dough but great favour. Oh and it makes a great mash instead of potato on cottage pies. 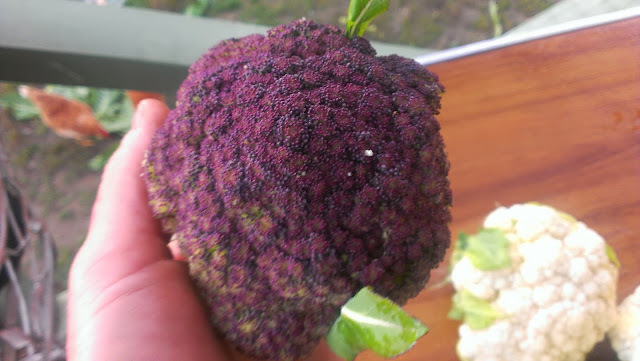 Yum I hope my cauliflowers are growing this year.